We no longer stock glass carboys. I may have some used glass once in awhile, so ask. Will not ship. Available in Plain, not ported, in 3,5 and 6 gallon size! The Better-Bottle® PET carboys do NOT contain BPA. Bisphenol-A, which is BPA, is not present in the PET Better Bottle. Bisphenol-A (BPA) has nothing whatever to do with PET. BPA is NOT used to make PET plastics, nor is it used as a starting material to make any of the materials used in the manufacture of PET. I just thought I would clear up this point regarding this carboy in light of the recent (national) news. This PET product is a high end lab item. It does not breath (allow oxygen in) or leach (plastic materials) into the wine. It is resistant to chlorine-based (C-Brite) and other (percabonate: B-Brite, One Step, OxiClean) cleaners and dish cleaning (Cascade) items and Potassium Metabisulfite rinses. Do NOT let acid cleaners set long to soak, there have been reports of cracking. The use of carboy brushes is NOT recommended as they may cause scratching, which creates microscopic hiding places for bacteria, yeast, etc. PUT A TUBE SOCK on your carboy brush should you need a brush OR just agitate cleaning solution in the jug in a timely fashion. We also carry GLASS Gallon Jugs with a handle that take a # 6.5 bung and/or a 38 mm screw cap. They are handy for fermenting the juice you need to draw off the main carboy to allow room for fermentation. 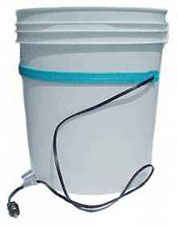 Bucket Fermenting 7.8 US gallon printed, includes lid with grommet, shorter squatty pail. We found that the taller 6 gallon pail had problems traveling. They measure 16" tall and 14 inches across the top of the lid. hole for bottling spigot. Spigot is NOT included. You could drill a 1 inch hole in the lower side of a fermenting bucket. Make sure the hole is high enough so that the spigot will clear the floor when attached. The lid are included with a bucket purchase or may be bought separately. 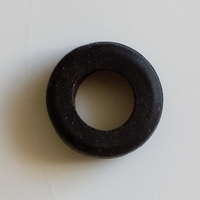 They are either black food grade or white and are DRILLED with grommet. Grommet for lid. Our lids come with a grommet, but if you remove it, put your grommet back on the lid before you put the lid on the must. Saves losing the grommet in the must or wort. 9/16"
Lid remover for buckets are yellow or orange. We have found that not all lid removers work with all buckets, but these are a good pairing.